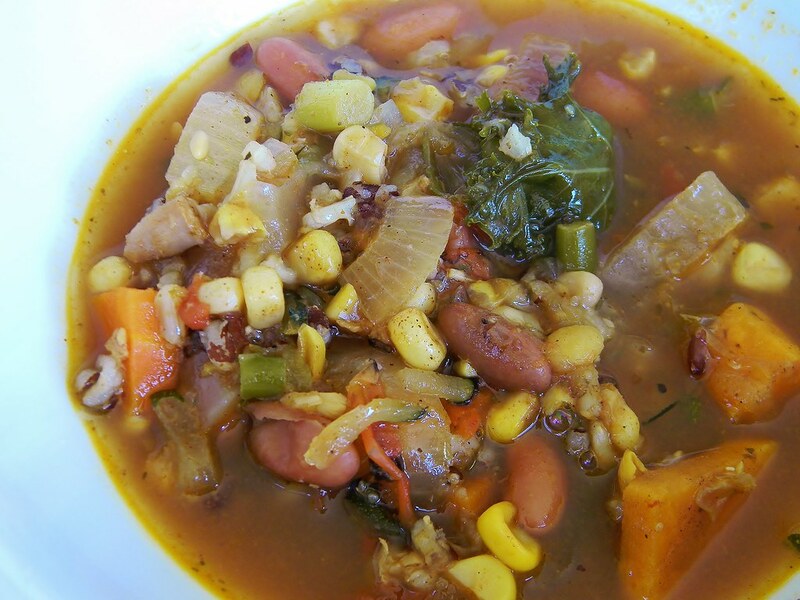 Mexican Turkey - Bean Soup #SundaySupper | What Smells So Good? Heat oil in a large, deep pot over medium heat. Add the onions and cook, stirring occasionally, for 10 minutes or until they begin to turn golden. Add the carrot, sweet potato, zucchini, garlic cloves and scapes, hot pepper and spices. Raise heat to medium-high and cook 4-5 minutes, stirring constantly, until fragrant and vegetables begin to soften. Stir in the broth and tomatoes and bring to a boil. Reduce heat, cover and simmer 20 minutes, until sweet potato is half-cooked. Add the remaining ingredients (except kale), re-cover and simmer 20-25 minutes longer, until grains are done. Stir in kale and remove from heat. Serve.